Home » Events » RAIN DATE: 7-17-2016 John Flynn & 5th Anniversary Celebration! RAIN DATE: 7-17-2016 John Flynn & 5th Anniversary Celebration! 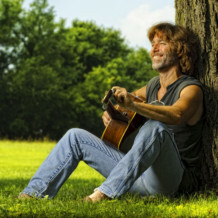 For the second in four concerts in our 2016 Summer Performance Series, Friends of Glen Providence Park is delighted to present activist-songwriter John Flynn! He writes songs on behalf of “the lost and the lonely, the shackled and scarred.” A “quintessential folk singer,” Flynn has been compared Woody Guthrie, Phil Ochs, and Kris Kristofferson. He will perform a set for kids, and a set for adults. UPDATE – RAIN DATE! After an initially clear forecast today, the forecast for the next few hours is not great, with thunderstorms rolling through – so we are using our Sunday rain date!!! We will also celebrate the 5th Anniversary of Friends of Glen Providence Park! We held our first meeting on July 14, 2011 at Seven Stones Cafe in Media – appropriately enough, they are the sponsor for this concert. Join us as we celebrate our first five years with a concert and anniversary cake! Bring a blanket or chair, and relax on the lawn by the historical stage to enjoy a late afternoon concert! After the concert, head into Media for dinner and shopping, just 2 blocks away on State Street. As with all of our events, this concert is free and open to the public. On your way to dinner, check out the Opening Reception for Philadelphia-based muralist and paper cutout artist Joe Boruchow – that’s 6:00-8:00 at the Media Arts Council Gallery, next to Sterling Pig by the park entrance! Concert Sponsor Seven Stones Cafe is one of the most inviting spots in town! With great coffee (and artfully prepared lattes! ), Seven Stones has delicious offerings to enjoy over good conversation, a meeting, or a book. And the family-owned cafe is located just over 4 blocks from the entrance to the park! For logistics, and for information on our June, August, and September performances, please see our 2016 Summer Performance Series announcement!